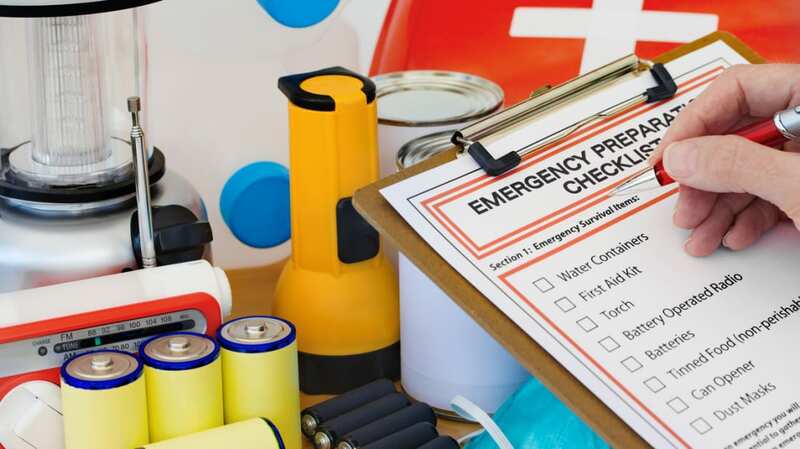 It’s always a smart idea to prepare for the worst while still hoping for the best, and one way to stay safe in the midst of a sudden crisis is by packing a go-bag, an emergency carryall with just-in-case supplies. A go-bag’s contents will vary according to your own personal needs, but experts typically suggest including a few staple items. We don’t recommend becoming a walking grocery store, but every go-bag should include at least a three-day food supply, and at least one gallon of water per person per day. That said, don’t just raid your pantry for leftover bags of chips or Lunchables and stash them in a duffel bag. Opt instead for healthy non-perishables, like pouches or cans of tuna and beans (don’t forget a manual can opener!) and protein or granola bars. Pre-packaged nuts, trail mix, beef jerky, and peanut butter are other good options, as they’re packed with energy-boosting protein. You’ll also need plenty of water for both hydration and sanitation purposes, but if you don’t want to weigh down your pack with multi-gallon bottles, consider bringing water-purifying tablets, mini-filters, or a reusable water bottle equipped with a filter. Additional go-bag items include a prepackaged first aid kit (customize it by adding your prescription medicines to the mix), an emergency whistle, a wrench or pliers (for turning off water valves, circuit boxes, and gas appliances), a flashlight and extra batteries, a battery- or hand-powered radio, and a NOAA Weather Radio with tone alert. These items are all likely available at your local big box outdoors store. Other less obvious—but no less important—supplies include a dust mask (it helps filter contaminated air), plastic sheeting and duct tape (to construct a makeshift shelter), and wet wipes, trash bags, and plastic ties (to stay clean and hygienic in the absence of showers and routine garbage collection). Cell phones can be just as useful in a crisis as they are for checking social media feeds, but you should pack some old-fashioned local maps along with extra chargers and phone batteries. That way, if you lose service, you won’t be stuck relying on a malfunctioning Google Maps page to find your way. While shopping for your go-bag (it should be durable, yet lightweight), look for a large waterproof pouch to store money, credit cards, and essential documents, including copies of your passport and visas; your driver’s license; and your marriage, birth, adoption, and naturalization certificates. If you have pets or an older relative, you may also want to purchase and pack a second bag just for them. While essential, these go-bag suggestions are by no means comprehensive. Feel free to add extra supplies, or tweak the ones above as needed. But since disasters can strike at any time, do consider packing three separate go-bags: one for home, one for work, and another for your car. Hopefully, you’ll never need them—but it’s always worth your peace of mind to have them.